Just imagine how sweet it will be when this cheerful arrangement arrives at the door, bringing smiles to all who receive it. Arriving in a sparkling glass vase, the rich color and alluring fragrance of this popular bouquet is certain to perk up Mother's Day or any Springtime occasion. Dusty Miller, Leatherleaf Fern, Lush Greenery and more. Whisper Soft Bouquet is a hand delivered gift. These gifts are delivered by one of our local design centers located throughout the United States and Canada. Same day delivery is available for most gifts when ordered before the cutoff time. 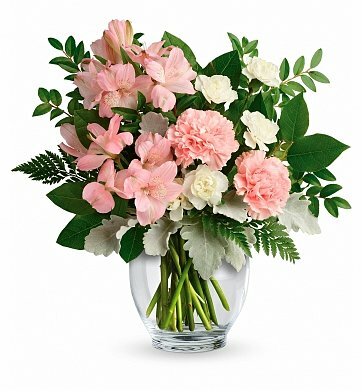 The cutoff time for Whisper Soft Bouquet is 2 PM in the recipient's time zone.